Sangria was born in 2011. Found in the wild by people who thought she’d make a good pet, she spent the first months of her life with people and dogs for company. Finally, realizing they wouldn’t be able to care for her as she matured, they turned her in to the Arizona Game and Fish Department. By that time, however, her health was in serious decline. When she arrived at Southwest Wildlife she was sick and malnourished. Sangria spent many months in the clinic, while we built up her strength and health. It’s critical for coyotes, and other wild carnivores, to have a proper diet when they’re very young in order for their bones and internal organs to develop correctly. A nutritionally adequate diet would include whole prey, with fur, bones, muscle and organ meat. As a result of the poor diet Sangria had when she was young, she has lots of health problems, including metabolic bone disease, cataracts in both eyes and hearing loss, and is very small in size. Today, Sangria has an enclosure at our Center and is strong enough to be out on her own. She’s still very tiny and it’s likely there will be continuing health issues for her. She wasn’t raised with other coyotes and doesn’t get along with them, so she’s living on her own. But she is not lonely. She can still interact with the other coyotes to either side of her and sings with the pack whenever the mood to howl strikes. 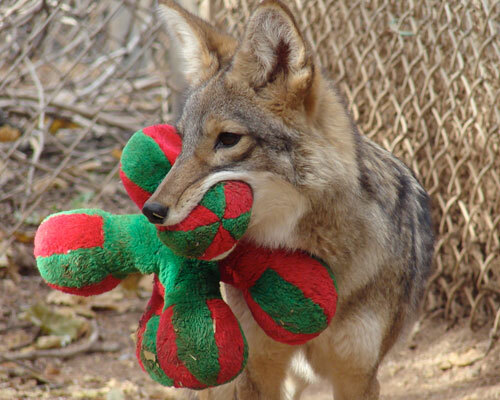 Sangria could be out in the wild today, being a normal coyote, if the people who found her had contacted a wildlife rehabilitator immediately. It’s never a good idea to try to raise a wild animal. Sangria takes extra care. She not only needs extra medical attention but she also needs more mental stimulation than many of our other animals. 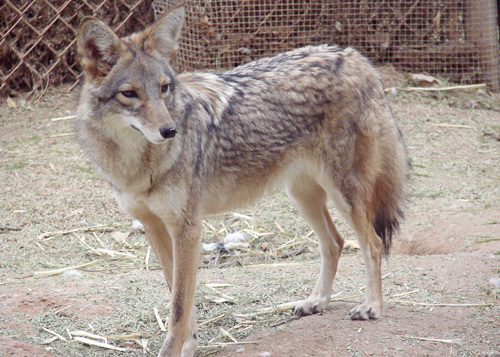 Your sponsorship helps to cover these expenses, and contributes to the care for many other coyote residents that call Southwest Wildlife home.